Many motorists on the M56 between Runcorn and Chester experienced significant delays on Bank Holiday Monday. 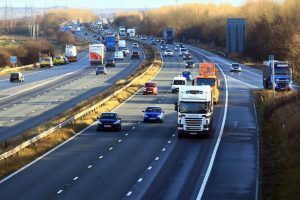 Two accidents in the late afternoon, one on the east bound carriageway and the other west bound on the M56 caused serious congestion. About 4.45pm one lane was reported being blocked west-bound heading away from Runcorn towards Chester, between J12 A557 (Runcorn) and J14 A5117 (Hapsford), following a multi-vehicle accident leading to queueing traffic. At much the same time one lane east-bound was also reported blocked, heading away from Chester towards Runcorn, and queueing traffic due to an accident between J15 (M53) and J14 A5117 (Hapsford). This article was added on Tuesday, April 7th, 2015 at 5:36 pm and is categorised under Cheshire News, Chester News, General News, Runcorn News. Both comments and pings are currently closed. Error: Error validating access token: Session has expired on Saturday, 09-Mar-19 13:12:58 PST. The current time is Wednesday, 24-Apr-19 20:01:41 PDT.